Anchor historian, Dave Burkhart, tells the story of the unique collaboration that resulted in the label, 6-pack and crown (cap) for Anchor Porter. When you think of great food pairings for Anchor Porter® you might think of oysters, Thai food, or perhaps a nice marinade for barbecued salmon (my personal favorite). But Big John’s Hamburger Fixin’s Spanish Rice Dinner? 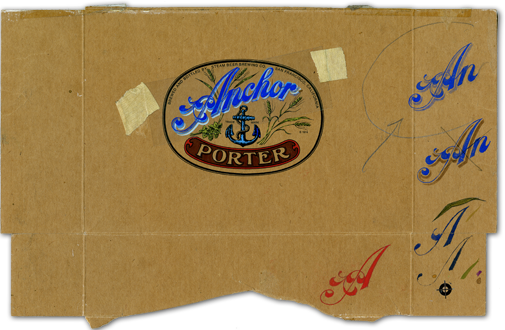 Not so much, unless you know the story of the design of the Anchor Porter label and 6-pack. In the early 1970s, while immersed in the process of creating America’s first craft-brewed porter, Fritz Maytag, by happy coincidence, met Jim Stitt. Jim was an already successful illustrator and graphic artist, who shared a studio on Stockton Street with a young copywriter. The copywriter introduced Fritz to Jim and the two hit it off, sharing an aesthetic that has become a beautiful and vital part of the Anchor story. Jim’s first assignment was a label for Fritz’s soon-to-be-bottled Anchor Porter (our first brew was in 1972). 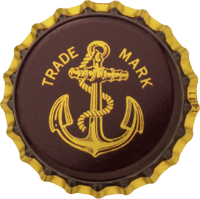 Fritz proposed that the script “Anchor” from our 1930s Anchor Steam® label, which had also been used by the Brewery pre-Prohibition, would make the perfect centerpiece for the new label. While collaborating on the label itself, it came time to design the Porter 6-pack. Fritz was concerned that the 6-pack board—with its clay-coated bright white surface for printing on one side and its uncoated kraft-colored surface on the other—would give the carrier a slick look that clashed with the old-fashioned look of the label and the rich, dark color of the beer. To help visualize the way the 6-packs might look if run through the press upside down—clay-coated side down, kraft side up—he asked Jim to provide comps. Short for comprehensives, “comps” are usually quite formal and elaborate undertakings to show a client the look and feel of a new design. But this was 1970s San Francisco! So Jim simply grabbed an empty box of Big John’s and got to work. The result was some great looking, timeless label art—craft beer on kraft board! 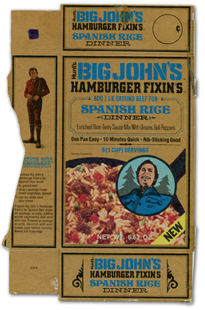 Note the circled art on the Big John’s comp, showing the script Anchor and drop shadow as it would soon appear on the kraft-colored, inside-out 6-pack (today’s 6-pack, by the way, is all kraft, both inside and out). It’s a look that has remained a part of the Anchor look—and narrative—for nearly forty years. The Porter crown (we call bottle caps crowns—perhaps the subject of another blog post someday!) has a good story too. In the 1990s, when Fritz and I were making our periodic reassessment of our packaging, the color of the Porter crown just didn’t seem quite right. The beer, the label, the 6-pack, and the case were “A+,” as Fritz would say, but the crown color, although still nice, had drifted a bit over the years to, perhaps, a “B.” There are no “Bs” at Anchor. Fritz and I went through all the browns in all of the color books (Pantone, Toyo, you name it) and solicited samples from our crown supplier as well. Still no luck. So I went shopping. Not for beer, for chocolate. “Surely there must be a candy wrapper out there somewhere with just the right brown,” I thought. And sure enough, we found the perfect chocolate-brown color for our crown and more than enough chocolate for the entire staff that day! Can you guess which chocolate bar wrapper served as the inspiration for our Porter crown? The color on the crown makes me think of the M&Ms wrapper. i know it’s no chocolate bar though. Perhaps Godiva. Best Porter on the planet! I was surprised to find it at a highway rest stop in Denmark. I have it specially ordered for our yacht club here in San Francisco Please, please keep producing it and don’t ever fiddle with the formula!